I’m not trying to be artsy. Michael has taken over our kitchen table with jigsaw puzzles since Christmas. No, that’s not Kermit the Frog. What that is, is a smoothie. Made with spinach. Pear. Strawberries. Banana. Water. But mainly spinach. I don’t mind my green leafies, as long as they are prepared by a chef with some sort of combination of goat cheese and warmed pecans with a drizzle of some sort of concoction that does not contain guar gum. But when it comes to a regular supper at home, when time and space in our galley kitchen is precious, time devoted to making a salad always seems to come last. Sure, salads is Michael’s specialty (as is grilled cheese sandwiches) and we could share the kitchen, but he and I both know we’d end up in couples therapy in a matter of weeks. Part of the success of our marriage is a strict, I cook, you clean. You cook, I clean policy. That comma signifies the space and time we allow each other to get on with our business. There may be punishment for the party that dares to cross the threshold while one of us is working in the kitchen, but that’s for another type of blog, and I tap the pink fur lined cuffs under the cupboard out of sight with my toe. Starts with my Ironman, Death Race, marathon and triathalon racing Auntie Ev. Oh yes, she’s fit as a fiddle. She doesn’t look her age. And she eats vegetables for fun. She started bringing a green smoothie concoction to my Mom. I looked at them, through the blue tint of the plastic bottle and would silently gag in my head. Mom would try to convince me that “they really don’t taste that bad!”. Right Mom. Sure. Then my sister is ranting and raving about the new Nutri Ammo** machine she bought. She claims she never felt better! More energy! Sleeping better! Taking stairs with a lightness of foot! And to tell you the truth, she’s been looking great and does have more pep in her step. I cautiously asked her, what do you put in your smoothies? She replied, “anything!”. So I searched the net and found a Nutri Ammo** machine at a national tire store. Stopped also at the grocery store and bought a bag of spinach, celery, carrots, apples, pears, grapes, pineapple, mango. Felt an early rush of healthfulness at the checkout line with my order of fresh healthy foods. I felt strong enough to resist the bars of chocolate, bags of potato chips, lip balm and magazines. I got home, cleaned the Nutri Ammo** machine, read the instructions, and added spinach, apple, strawberries and water to it. I gave it a whir. I took it out of the machine, poured the green stuff in a glass and took a tentative sip. Hm. Not bad. Not bad at all. Before you knew it, I ate (drank) two cups worth of spinach! I did the “I ate two-cups of spinach and didn’t gag once dance” in the kitchen, and had visions of myself prancing and throwing back my head in joy on a beautiful sandy beach in my two-piece bathing suit. Then of course I had visions of all the loose skin I might have as the result of my dramatic weight loss, then wondered if they have Spanx bathing suits. So how to introduce our new healthy lifestyle to Michael? I presented him with his glass. He took a sip. Did the eyebrow raise of approval, and claimed it wasn’t so bad. He did declare honey or sugar would help, and I immediately scolded him that I will NEVER get in a two-piece Spanx bathing suit if I keep adding sugar to my food. 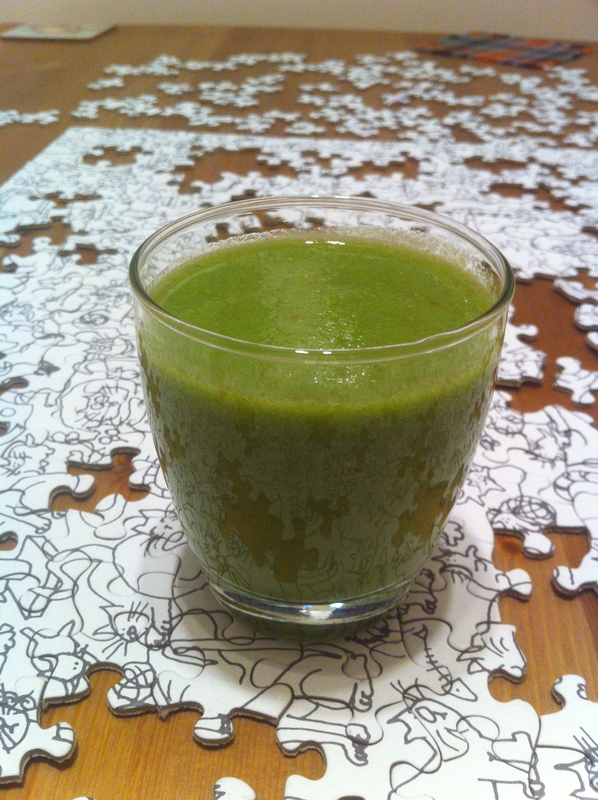 Michael has affectionately named the green smoothie, a Slurry (TM). We are trademarking the name because we have visions of Slurry machines and stores all over North America, Australia, New Zealand, the UK, Germany and Russia. We have visions of happy fit people in two piece Spanx bathing suits feeling renewed vigor playing volleyball on sandy beaches. It’s a happy vision with dollar, pound, Euro and ruble signs in our eyes. There are several machines on the market that will “chew your food for you” (our Slurry(TM) Machine’s tag line). The Nutri-Ammo** is just one version, is a reasonable price, and is not that flimsy despite being a Seen on TV machine. There are more industrial models available like the Vita-blend** at Costco. Then there is the granddaddy blender of them all, The Blendtec Blender. It blends everything. Check it out. So we’ll see if my new found love of spinach Slurry(TM) will give me a new lease on life. There is something satisfying about reaching the end of the day knowing that I’ve eaten my 7 – 8 servings of vegetables and fruits. It doesn’t leave your teeth green like that wheatgrass stuff, does it? Not at all. Squeaky clean, with nary a bit of spinach lodged between teeth.